Digging a hole is still my preferred way of escape. 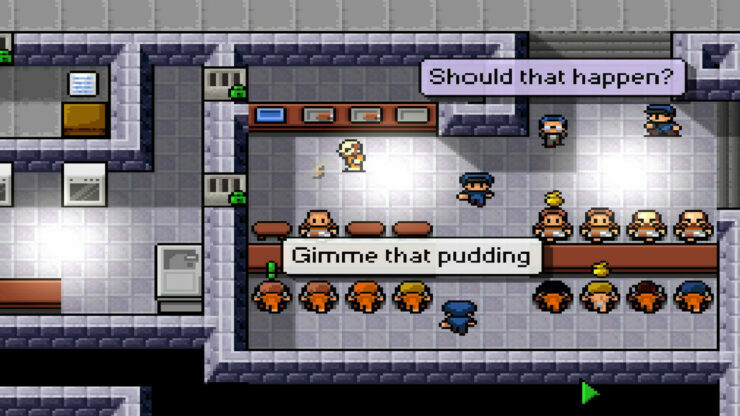 Team 17 and Mouldy Toof just announced today that the iOS version of their prison escaping simulator, The Escapists, tops the charts in the App Store. As of yesterday, The Escapists took the current the number 1 spot in over 23 countries while still keeping a 5 Star rating. 6 different methods to bust your way out including digging out and prison takeovers! Sheet Ropes and weapons such as the Sock Mace, Comb Blade or Cup of Molten Chocolate! Choose from touch screen or virtual d-pad controls! The Escapist is available now on iOS and Android for $3.99. One of my most anticipated features in The Escapists 2 is co-op for up to four players. Multiplayer was something we saw our incredible The Escapists community cry out for in the original game and something I’m so excited to see fully realised in the sequel, both local and online. As a player with quite a few prison escapes under my own belt I can’t wait to work together with my friends on escapes.